En español | Men who use aspirin or other blood thinners after treatment for prostate cancer have a substantially lower risk of dying or seeing the cancer spread to another organ, new research shows. In a study of nearly 5,300 men with prostate cancer, only 4 percent of those taking blood-thinning medications such as aspirin had died from a recurrence of their cancer after 10 years, versus 10 percent of those not taking the medication — reducing the risk of dying from cancer by more than half. Some say aspirin cures many ills, others warn against its use. Blood thinners interfere with blood-clotting mechanisms, said Kevin Choe, M.D., a radiation oncologist at the University of Texas Southwestern Medical School and lead author of the study. "There is good evidence from laboratory studies which suggests that these clotting mechanisms play an important role in cancer growth and spread as well," Choe said. Because prostate cancer patients tend to be older, many are already taking these medications for cardiovascular problems. Choe's team wanted to see whether they were receiving an additional health benefit. The study, presented recently at the annual meeting of the American Society for Radiation Oncology, drew on the national Cancer of the Prostate Strategic Urological Research (CaPSURE) database, which included medical records for thousands of prostate cancer patients. 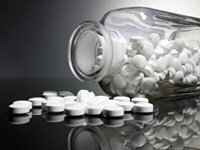 Most of the nearly 2,000 men studied were taking aspirin, and some took warfarin (Coumadin), other blood thinners or a combination of medications. "We found that prostate cancer mortality was significantly lower if you were on one of these medications," Choe said. "When we looked further at which of these medications was most important for this reduction, we found that it was aspirin that seemed to have the biggest benefit." 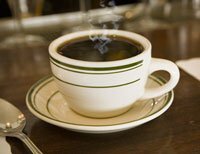 Coffee may lower the risk of prostate cancer (and offer a slew of other benefits). Christopher Logothetis, M.D., a medical oncologist at the University of Texas MD Anderson Cancer Center in Houston, said the study is in line with others that suggest aspirin's blood-thinning and anti-inflammatory properties reduce the risk of many kinds of cancer. Such studies tend to look at existing patient records and can only determine associations, not explain why aspirin might help beat prostate cancer, he notes. He concedes there haven't been any studies where some men received aspirin and others a placebo to see what the differences might be. But Logothetis says based on the evidence, it is "reasonable" for doctors to recommend a small daily dose of aspirin to their prostate cancer patients, except for those patients who are allergic to the medication, suffer from ulcers or have bleeding problems. Choe was a little more cautious, saying further studies should be done before making routine recommendations to give aspirin to prostate cancer patients, but if you are already taking aspirin "then you may have additional benefit for your prostate cancer as well."